Phan Van Do and Mike Boehm have established and nurtured relationships with partnering organizations in Vietnam. Hoi Phu Nu Quang Ngai or Quang Ngai province Women’s Union are our partners for all micro-credit projects, wells providing water to villages, Compassion Houses for extremely poor women and potential future projects such as a fish sauce factory in Binh Chau village. The Vietnam Women’s Union was formed by Ho Chi Minh in 1930 in their struggle against French colonization and now are established in all villages in Vietnam. 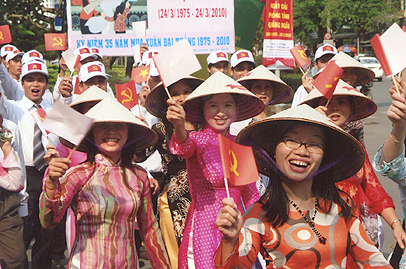 The Women's Union of Quang Ngai celebrating the anniversary of the reunification of their country. Hoi Nan han chat doc Da cam/Diosin or Vietnam Association for Victims of Agent Orange (VAVA) are our partners in funding the construction of Compassion Houses for victims of Agent Orange. Founded relatively recently, December 17 2003, this organization was established as the official representative for Vietnamese victims of Agent Orange. 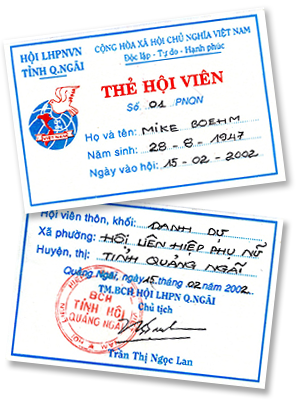 Hoi Cuu Chien Bien Viet Nam or Vietnam Veterans Association are our partners for the building of Compassion Houses for extremely poor Vietnamese veterans. Ministry of Education and Training (MoET) is our partner for all school related projects from the construction of primary schools in My Lai to teaching English in Quang Ngai province. an unprecedented event for the Women's Union.